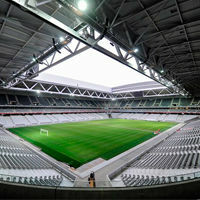 Naming rights deal was scrapped, but the new arena in Lille changes its name anyway. The plan is to honour recently deceased mayor Pierre Mauroy, according to info-stades.fr. After the initiative of current mayor Martine Aubry, Lille municipality unanimously accepted the renaming of the new stadium in honour of Pierre Mauroy. Former prime minister and mayor of Lille for decades, Mauroy passed away on June 7. The patronage has its impact on the stadium's finances, because no naming rights deal is expected to be signed currently. In the past weeks an effort by Partouche casinos was denied for ethical reasons, despite envisaging some €2 – 2.5 million per year. Interestingly, Mauroy wasn't a fan of building the great arena for OSC Lille. He expected the club to get a big venue once they become a big club.